Arachnophobia affects somewhere between 3.5 and 6.1 percent of the worldwide population. That number may seem small and insignificant, but when you consider that it represents at least 266 Million people around the globe, the percentage is pretty staggering. This all-too-common fear makes a lot of sense when you consider the number of deadly spider species that exist in the world. A whopping 40,000 species of spiders exist in on Earth, and although very few of them are poisonous to humans, almost all of them carry venom. Of the 40,000 species worldwide, just 3700 exist in the United States, and only about twelve or so are significant in terms of public health concerns. Those spiders with medical significance are split into two major groups, the brown spiders and the widow spiders. Widows being slightly more significant than browns overall. When you think of dangerous spiders, more often than not you probably picture the black or brown widow spiders, but there are other incredibly dangerous species out there that get much less attention. One of those species is the brown recluse spider. Outdoor Life ranked it the fourth most dangerous spider in the US in 2011. 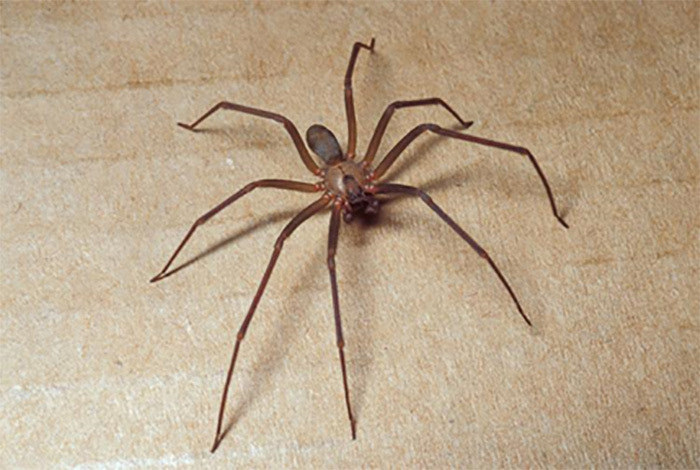 Also known as the violin spider, fiddler, or fiddleback, the brown recluse spider is characterized by the violin-shaped patch on the spider’s head, not its abdomen. It is typically a yellowish-gray-brown color and has gray hairs covering its abdomen. Its legs are long and thin and are typically darker than its body. Although the violin or fiddle shape on the head is what is usually used to identify these spiders, their eyes are also a giveaway. The brown recluse has only six eyes compared to the eight most other species carry. The six eyes are organized in pairs in a semi-circular pattern around the head. Female brown recluse spiders are larger than the males. The webs these spiders weave are often irregularly shaped, small, and untidy, and are usually not inhabited for long. Brown Recluse spiders are seen much more often outside of their webs than within them, because of this they are considered hunting spiders. Generally, brown recluse spiders are nocturnal, and will not be seen out during the day unless there home was disturbed and they are running to another hiding place. Primarily found in the southern and Midwestern United States, brown recluse spiders are adapted to many temperatures and levels of humidity, but prefer dry, sheltered spaces, and are almost never seen by people because of their reclusive traits. Their name is derived primarily from their color and habitat. These spiders live under rocks and in crevices of trees and stones in nature, but when they come into the home they will often take up residence in spaces that aren’t used much like baseboards, basements, attics, or the back of closets. They cannot climb smooth surfaces, so you may encounter them trapped in your bathtub, shower, or sink. Because they are often hidden in little-used areas, human bites are quite uncommon. However, if a piece of clothing is taken from storage without being shaken out, the spiders may be holding on, and may bite out of defense. 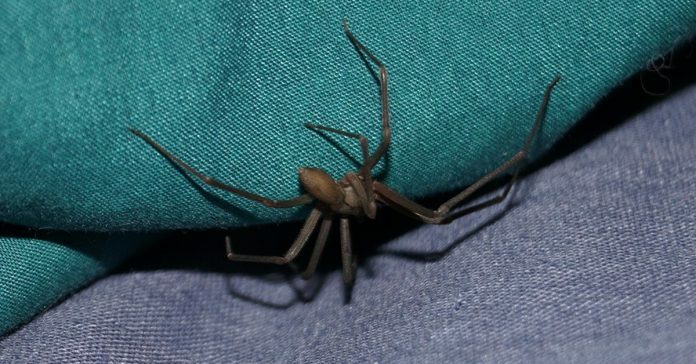 Unlike many spider species, brown recluse spiders do not balloon, or use their silk to travel by air to disperse; instead they typically hitchhike to new locations on furniture or in boxes. They are well established in this way of getting from place to place, and can go for months without eating and survive in hot, dry environments. Rarely these spiders are also called hobo spiders because of their hitchhiking. They are not dangerous when hitchhiking unless you come in direct contact with them on or under a box or piece of furniture, and you will most likely not ever know you had a hitchhiker with you. Just one female hitchhiking to a new location is all it takes to form an infestation of these arachnids. A female brown recluse that mates just once in it’s whole life can produce eggs throughout her lifetime and can have up to 150 spiderlings per year. Once the brown recluse spiders create a retreat, these spiders rarely travel far from it, so infestations occur very quickly and can become problematic. It is important, therefore to check out furniture and boxes to ensure there are no spiders within or attached before moving from home to home. It’s incredibly difficult to control these spiders once they are established within a structure, primarily because of their reclusive and nocturnal habits. If you see one of these spiders, you want to assume there are more, because of how quickly infestations take place. Successful control will require many different methods and strong management of the control plan, so it may be a good idea to hire a company to get rid of the problem rather than trying to attack it on your own as a home or business owner. If you choose to use only one control method, it will likely fail. The first step is simply not to give these spiders a place to hide. If you are storing boxes in your attic or basement, or even your garage, it is smart to instead use bags or storage bins that seal tightly. The smooth nature of the containers and the tight seal will likely stop brown recluse from finding refuge in these spaces. If there are cracks and crevices in your home, around your fireplace, in baseboards, etc. it is important to seal them with caulk, expandable foam, or even weather stripping to avoid allowing spiders to gain access to these locations. Sealing around doors and windows will also help to prevent access to any and all critters. If you already have a problem with these spiders, there are a few methods you can utilize to trap them. One prominent method is to use a sticky monitor or sticky trap, which consists of covering a small piece of cardboard in adhesive, so the spiders get stuck when they try to walk across. Commercially made sticky traps often fold into a box or triangle to protect the adhesive from dust or dirt that may make it less effective over time. Not only do these traps stop brown recluse, they also stop other pests that the spiders may use as food, so the control here is twofold. Generally, pest control experts advise homeowners to use as many sticky traps as possible all over the home, despite their unpleasant appearance. If you have an infestation, using 50 or more traps shouldn’t be considered overkill because of the sheer number of spiders that may be living in your home. Another prevention and control method that is tried and true in the elimination of brown recluse spiders is the use of pesticides. These chemicals should be applied directly on cracks and voids where brown recluse may be living. In infested basements or attics, you may need a larger volume of pesticides. For larger spaces, using a residual pesticide is typically advised as apposed to aerosol foggers because brown recluse can hide so deep that the fog won’t contact them, and those that are affected by the fog may just be driven deeper into your home or stored boxes, rather than killed. Again, it is in your best interest to hire a company to take care of an infestation if it becomes problematic so that you can attack from all angles, however, it is unlikely that an infestation will become problematic. These spiders really are more afraid of you than you are of them, and they are not known to be aggressive toward humans. Although brown recluse spiders are hunters by nature, they are still usually keener on staying out of the way of humans than we are of avoiding them. They would much rather run than bite if they are seen out of their homes, but bites still happen, especially when you take an item out of storage without inspection and try to use it. Contrary to popular belief and scare mongering, brown recluse spiders can’t actually bite through human skin without counter pressure. So unless the spider is trapped against the skin in some way, you will likely not feel its attempt to bite you, and you will not see symptoms other than mild redness on the skin. 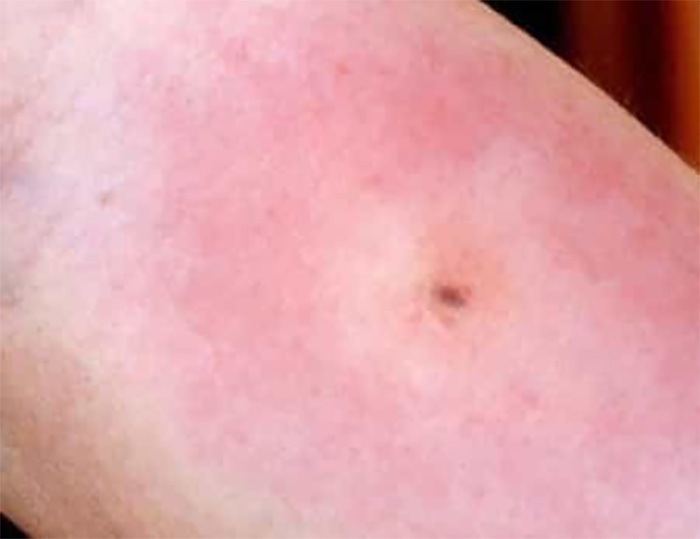 The symptoms and treatments of brown recluse bites differ slightly from other spider bites because of their medical significance. Fiddleback venom has the ability to destroy human skin, so although these spiders are not deadly, they can create extreme pain and discomfort that lasts for a long time. So how do you know if a brown recluse versus another less dangerous spider bit you? A bite by this type of spider is typically characterized by a stinging sensation and pain in and around the bite location. Often a small white blister will form at the site of the bite as well. Other symptoms of a brown recluse bite may include reddened skin near and at the site of the bite, followed by a the formation of a blister, itching for anywhere from two to eight hours following the bite, an open sore or ulcer, fever or chills, skin rash with tiny and flat purple and red spots, nausea or vomiting, and joint pain. Brown recluse spider’s venom causes the breakdown of tissue, also known as necrosis, which usually develops about a week or so after the initial bite and can take months to heal. There is no antidote to their venom, so controlling the infected skin area is the top priority of doctors and bite victims. Initial bite: No pain to mild stinging sensation, similar to bee sting. First one to eight hours: Pain and redness may develop, venom begins to destroy tissue in bite area, and inflammation occurs from body’s immune response. Itching begins spreading from the bite site throughout the body. Day two to day seven: Symptoms of a mild bite improve slowly, no additional symptoms occur. More sever bites will see worsened symptoms including destroyed skin and tissue in bite area, blistering and pus show up in center of bite area. Blisters may fill with blood after pus is eliminated. Day eight and beyond: After the blister in the bite area bursts, a scab will form. 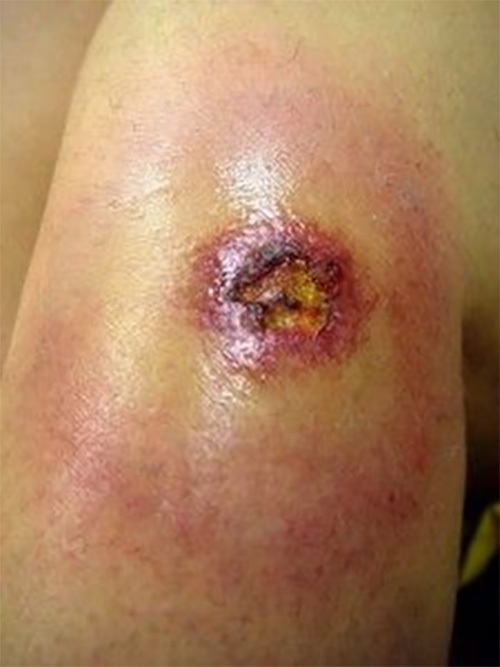 Once that scab falls off, a painful ulcer typically occurs where blister was. The bite area may finally heal and scar up to 12 weeks after the initial bite. The most important thing you can do when bitten by any spider or snake is to remain calm. The more you move and the faster your blood flows, the further the venom can spread, and the more venom can get into your bloodstream. Deep breathing and slow movements are, therefore, incredibly advantageous. Once you are calm, slowly retrieve a cool, wet cloth to apply to the bite, or cover the bite in a cloth and apply ice over top of the cloth. Do not apply a tourniquet, as it will likely cause more harm, and try to positively identify the spider that has bitten you, catching it if necessary so that doctors know what protocols to implement. Your doctor will likely ask you to describe the time and place where the bit occurred, what you were doing, how the symptoms have progressed, and if anything has changed since the time of the bite. If you are certain your bite is from a brown recluse, it is best to get in to see a doctor as soon as possible to begin treatment. It’s important to note that young children, the elderly, and those who have weakened immune systems are more susceptible to the venom of brown recluse spiders than healthy adults. Those in the first category should be taken to a doctor immediately after a bite occurs, while most adults can wait and watch symptoms. For those who are experiencing only mild symptoms of a brown recluse bite, simple measures like washing the area with soap and water and applying antibiotic cream continually will likely help the bite to heal within a week with no excessive issues. In addition, continue to ice the area and take painkillers if necessary. For more severe symptoms hyperbaric oxygen therapy may be used to repair tissue damage, and in extreme cases skin grafts may also be utilized. Cases where children or adults with lowered immune systems are bitten are often addressed through the use of antibiotics. What Do Brown Recluse Spider Bites Look Like? Although we’ve done a lot of talking about symptoms, it’s important for you to see what these spider bites look like in pictures to help you understand the severity and stages more specifically. Below we will show you images and discuss what you are seeing to help you get a truer picture of the stages of these bites. Please note that some of these images may be disturbing, so please scroll through the next section at your own risk. This image depicts a brown recluse or violin spider. As you can see, the head features a fiddle or violin shape, which makes these arachnids easily identifiable. This photo represents the initial stage of a brown recluse spider bite. As you can see, the characteristic redness has appeared around the small bite and a blister is beginning to form in the center. The photo above depicts the next stage of a more severe bite. The blister has formed, and is now filling with blood after having been filled previously with pus. It is important to note that this person is treating their wound correctly by keeping it clean and covered in a bandage, likely with antibiotic cream as well. After the blister breaks on a brown recluse bite, an ulcer will typically form on the destroyed skin. It will look something like this, but could be far more sever and take up a much larger area depending on how much venom entered the body and how far that venom was able to spread before treatment began. Very severe cases may require skin grafts or hyperbaric oxygen therapy to be full healed. 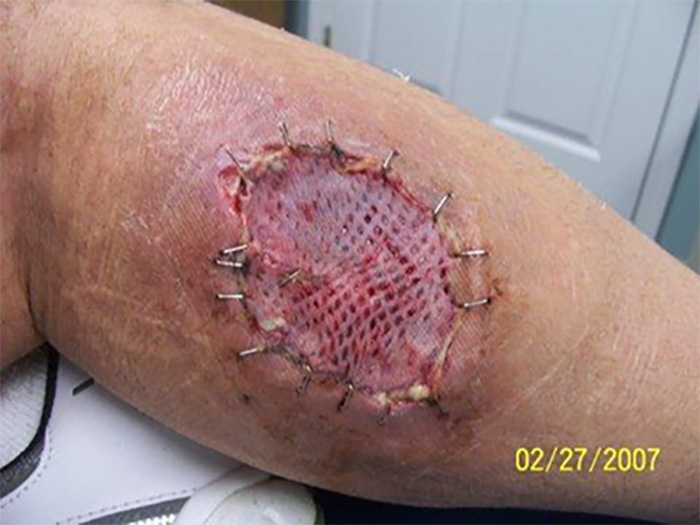 This image shows the beginning stages of the skin grafting process from a severe brown recluse bite. As you can see, these bites are nothing to mess with, and you should seek treatment immediately if bitten. Brown recluse spiders, also known as violin spiders and fiddlebacks, are one of two medically important spiders that are native to the United States. They live primarily in the southern states and the Midwest, although they do exist in other areas as well because of their ability to hitchhike from one location to another. Just one female brown recluse in a location can create an infestation, although you most likely will not ever see the extent to which your home or workplace infested thanks to the reclusive and nocturnal nature of these arachnids. Controlling the population of brown recluse spiders is difficult once they have set up an infestation because of their reclusive nature. In order to truly achieve positive results in this process, it’s important to use multiple methods of elimination including sticky traps and pesticides that will remain on surfaces for long periods of time. Bites from these spiders can be mild to severe, but tend to have a more severe effect on children, the elderly and adults with weakened immune systems because their bodies cannot naturally fight off the venom in the way a typical adult’s can. It is important, therefore, to get these individuals treatment immediately if bitten. The typical brown recluse bite does not hurt immediately, but symptoms will develop fairly quickly, and severe bites can take up to twelve weeks to fully heal. The most severe bites may require medical intervention to completely heal, while most mild to moderate bites will simply require antibiotic treatment and cleaning. Although brown recluse bites are nothing to mess with, they are incredibly uncommon as these arachnids would much rather be alone than near you, and will likely retreat when you come around. To ensure you don’t make them feel trapped, shake out stored items before using them. If you follow these instructions and make sure to be careful when removing items from little-used storage areas, you will more than likely never experience the pain and unpleasantness of a brown recluse spider bite. If you do encounter one, however, now you know how to address these bites immediately.